Andrea Collesano is born in Pontedera in November 1980. Obtained the artistic diploma in 2004, he graduated in painting at the Academy of Fine Arts of Florence, with a thesis analysing the metamorphic and mythological figures in Bocklin painting, focusing in particular on the zoomorphic part. He lives and works since several years in Forte dei Marmi. The sea element, the nature and animals are its main source of inspiration. He shows particular attention for animal kingdom. 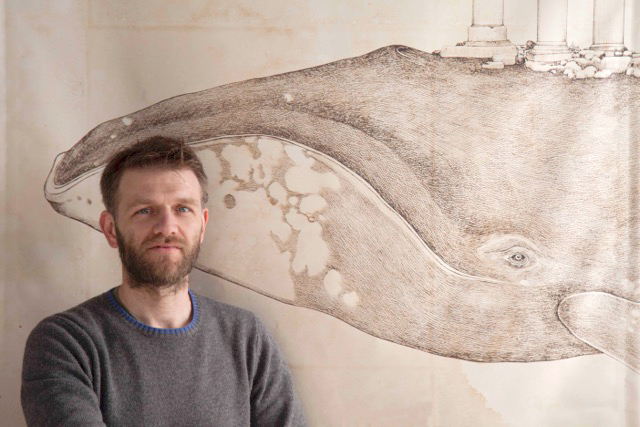 His subject range from small miniatures representing small insects to large works where the main characters are whales and other mysterious creatures of the abyss. with black ink on the paper he prepares by himself, giving to the material a taste of ancient times and a feeling of melancholic serenity. Stains and all the effect he obtained by the “invecchiatura”(lit. to make it older) often become the starting point to create his beasts. Inspiring by the ancient, to the lost and to the old symbolic and naturalistic engravings, he tries to recreate the World dwelling in his mind. In 2011 he tries one hand at sculpture in bronze, by transforming its animals in tridimensional figures. The dreamlike element that is present in his works mixes with the accuracy almost scientific and obsessive of the details. The symbol is repeated: keys, bicolour chess, horizons undefined and patches of architectural elements in the way of abandoned lighthouse. There is no trace of human presence just animals, such as suspended. Without time. As dreams.